(Update 4:51 a.m.) Tornado watch canceled for Bibb, Blount, Jefferson and Perry Counties. 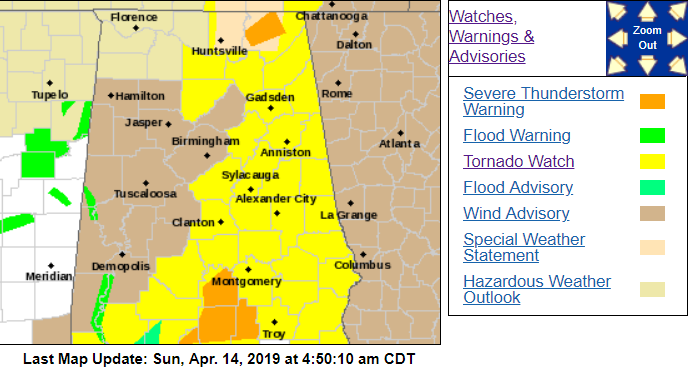 (Update 4:35 a.m.) Tornado warning for Shelby County canceled. (Update 4:29 a.m.) Tornado warning canceled for northern Shelby and Jefferson Counties. The warning is still in effect for southern Shelby. 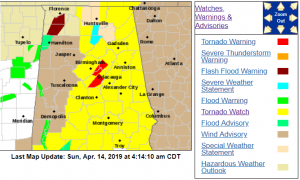 (Update 4:15 a.m.) A tornado warning has been issued for southern Shelby County until 5 a.m.
(Update 4:04 a.m.) A tornado warning has been issued for parts of Shelby, Jefferson and St. Clair Counties until 4:45 a.m.
(Update 3:45 a.m.) Warning for Perry and Bibb Counties has been canceled. 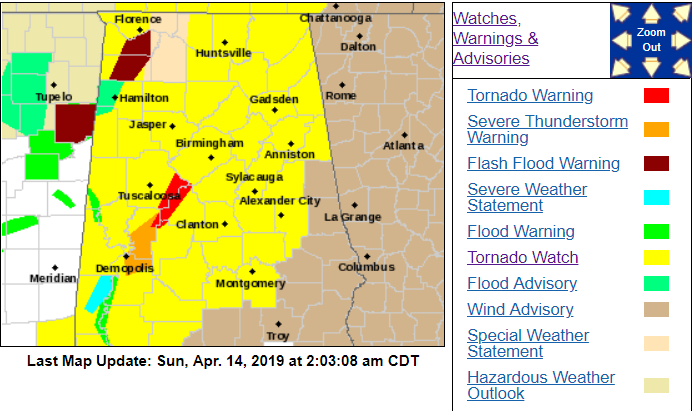 (Update 3:33 a.m.) A tornado warning has been issued for Perry and Bibb Counties. (Update 2:30 a.m.) A confirmed tornado was located near Coaling, or 14 miles SE of Holt, moving northeast at 45 mph. (Update 2:22 a.m.) A confirmed tornado was located near Low Gap, 12 miles NW of Brent, moving at 40 mph. 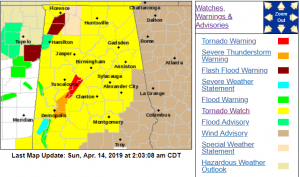 (Update 2:12 a.m.) Tornado warning issued for Perry and Hale Counties until 3 a.m.
(Update 2:04 a.m.) Tornado warning issued for Bibb and Tuscaloosa Counties until 3 a.m.
(Update 1:24 a.m.) Tornado warning issued for Tuscaloosa County continues until 2 a.m.
(Update 1:19 a.m.) Tornado warning issued for Perry and Hale Counties until 2:45 a.m.
(Update 1:07 a.m.) Tornado watch extended to include counties in east Alabama. PRATTVILLE, ROCKFORD, SELMA, SYLACAUGA, TALLADEGA, AND WETUMPKA. 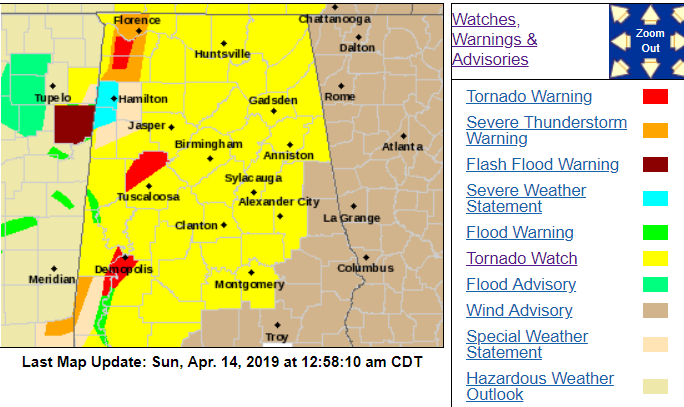 (Update 12:57 a.m.) Tornado warning issued for Tuscaloosa County. (Update 12:53 a.m.) Severe thunderstorm warning for Marion County canceled. 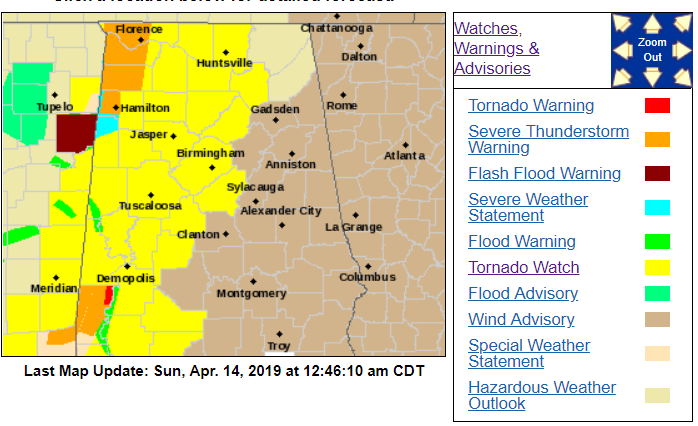 (Update 12: 50 a.m.) Tornado warning issued for Marengo and Sumter Counties until 1:45 a.m.
(Update 12: 47 a.m.) Tornado warning for Choctaw County until 1:15 a.m.
(Update 12:42 a.m.) Severe Thunderstorm warning for Lamar County canceled. 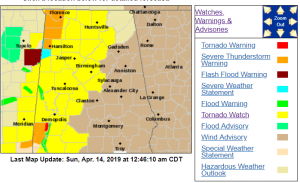 (Update 12:15 a.m.) Severe thunderstorm warning issued for Lamar and Marion Counties. 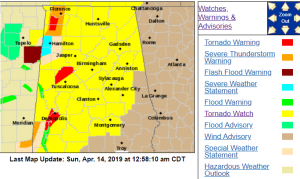 (Update 12:11 a.m.) Tornado warning for Pickens County canceled. 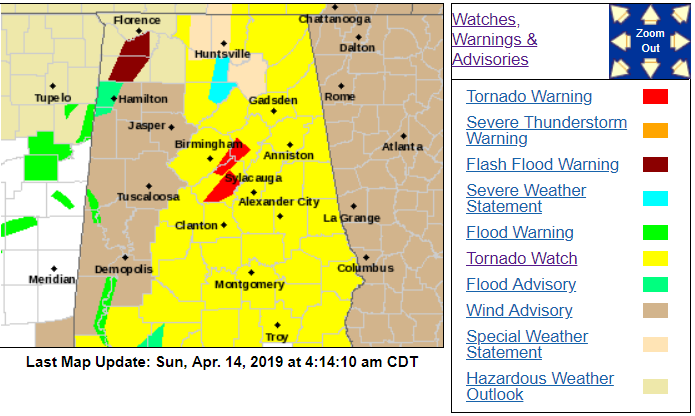 (Update 12:07 a.m.) Tornado warning for Pickens County canceled. (Update 12:00 a.m.) Tornado warning for Sumter County canceled. (Update 11:40 p.m.) A tornado warning has been issued for parts of Pickens and Sumter Counties. If you are in the warning area, get to a safe place now. (Update 11:39 p.m.) A severe thunderstorm warning has been issued for Northwestern Marion County and Northwestern Lamar County. (Update 9:04 p.m.) The National Weather Service in Birmingham has issued a flood warning for the Tombigbee River at Bevill Lock and Dam affecting Greene, Hale, Marengo, Pickens and Sumter Counties. BIRMINGHAM (NWS) — A significant weather advisory has been issued for southeastern Blount, northeastern Jefferson and northwest St. Clair Counties until 8:15 p.m. Pea-size hail and winds in excess of 40 mph are possible. Bibb, Blount, Fayette, Green, Hale, Jefferson, Lamar, Marengo, Marion, Perry, Pickens, Shelby, Sumter, Tuscaloosa, Walker, Winston. A tornado watch means tornadoes are possible in and near the watch area. Review and discuss your emergency plans and check supplies and your safe room. Be ready to act quickly if a warning is issued or you suspect a tornado is approaching. A significant weather advisory has been issued for southeastern Blount, northeastern Jefferson and northwest St. Clair Counties until 8:15 p.m.